Matriderm functions as an ideal adhesion barrier and protects during tendon healing. One-stage Reconstruction of Soft Tissue Defects with the Sandwich Technique: Collagen-elastin Dermal Template and Skin Grafts. J Cutan Aesthet Surg. 2011 Sep;4(3):176-82. doi: 10.4103/0974-2077.91248. A full-thickness soft tissue defect closure often needs complex procedures. The use of dermal templates can be helpful in improving the outcome. The objective was to evaluate a sandwich technique combining the dermal collagen-elastin matrix with skin grafts in a one-stage procedure. Twenty-three patients with 27 wounds were enrolled in this prospective single-centre observational study. The mean age was 74.8 ± 17.2 years. Included were full-thickness defects with exposed bone, cartilage and/ or tendons. The dermal collagen-elastin matrix was applied onto the wound bed accomplished by skin transplants, i.e. ‘sandwich’ transplantation. In six wounds, the transplants were treated with intermittent negative pressure therapy. The size of defects was ≤875 cm(2). The use of the dermal template resulted in a complete and stable granulation in 100% of wounds. Seventeen defects showed a complete closure and 19 achieved a complete granulation with an incomplete closure. There was a marked pain relief. No adverse events were noted due to the dermal template usage. Sandwich transplantation with the collagen-elastin matrix is a useful tool when dealing with full-thickness soft tissue defects with exposed bone, cartilage or tendons. Scars around nerves and tendons are very problematic. Surgery is commonly used to free the compromised structure. MatriDerm is then used to prevent scar recurrence. We developed a new and easy technique to apply MatriDerm. Single-stage Matriderm® and skin grafting as an alternative reconstruction in high-voltage injuries. Int Wound J. 2010 Oct;7(5):385-92. doi: 10.1111/j.1742-481X.2010.00703.x. Ryssel H1, Radu CA, Germann G, Otte M, Gazyakan E.
This article presents a retrospective analysis of a series of nine patients requiring reconstruction of exposed bone, tendons or joint capsules as a result of acute high-voltage injuries in a single burn centre. As an alternative to free tissue transfer, the dermal substitute Matriderm(®) was used in a one-stage procedure in combination with split-thickness skin grafts (STSG) for reconstruction. Nine patients, in the period between 2005 and 2009 with extensive high-voltage injuries to one or more extremities which required coverage of exposed functional structures as bone, tendons or joint capsule, were included. A total of 11 skin graftings and 2 local flaps were performed. Data including regrafting rate, complications, hospital stays, length of rehabilitation and time until return to work were collected. 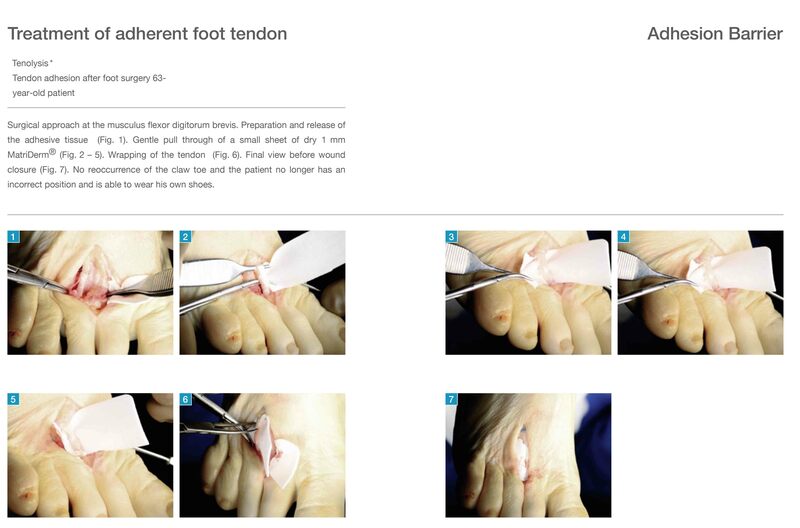 Eleven STSG in combination with Matriderm(®) were performed on nine patients (success rate 89%). One patient died. One patient needed a free-flap coverage as a secondary procedure. The median follow-up was 30 months (range 6-48 months). The clinical results of these nine treated patients concerning skin-quality and coverage of exposed tendons or joint capsule were very good. In high-voltage injuries free-flap failure occurs between 10% and 30% if performed within the first 4-6 weeks after trauma. The use of single-stage Matriderm(®) and skin grafting for immediate coverage described in this article is a reliable alternative to selected cases within this period. New indications for artificial collagen-elastin matrices? Covering exposed tendons. Dermatology. 2009;219(3):272-3. doi: 10.1159/000232387. Epub 2009 Jul 31. Wetzig T1, Gebhardt C, Simon JC. 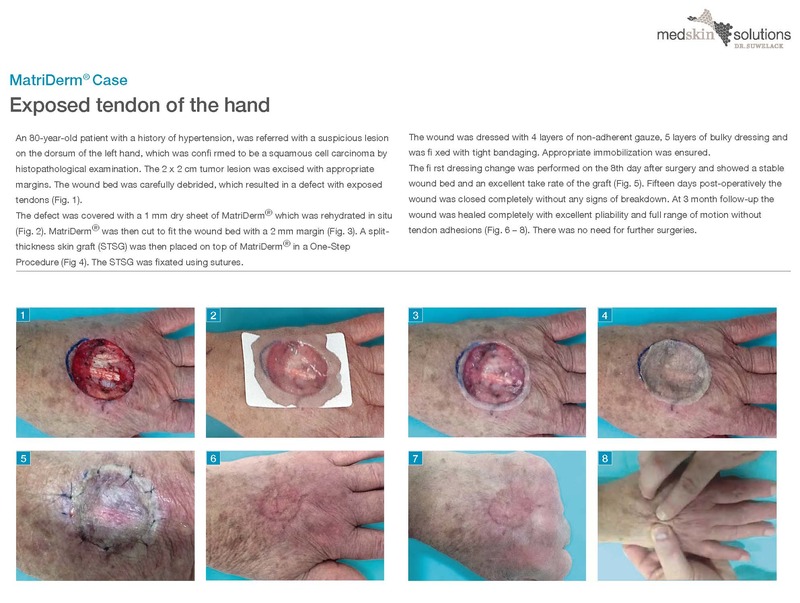 We present an 80-year-old patient who presented a defect with exposed tendons on the dorsum of the hand after micrographic controlled tumour excision. The defect was closed using a combination of artificial collagen-elastin matrix (Matriderm) covered by an autologous split-skin graft in a 1-step approach resulting in rapid healing and good functional and cosmetic results. 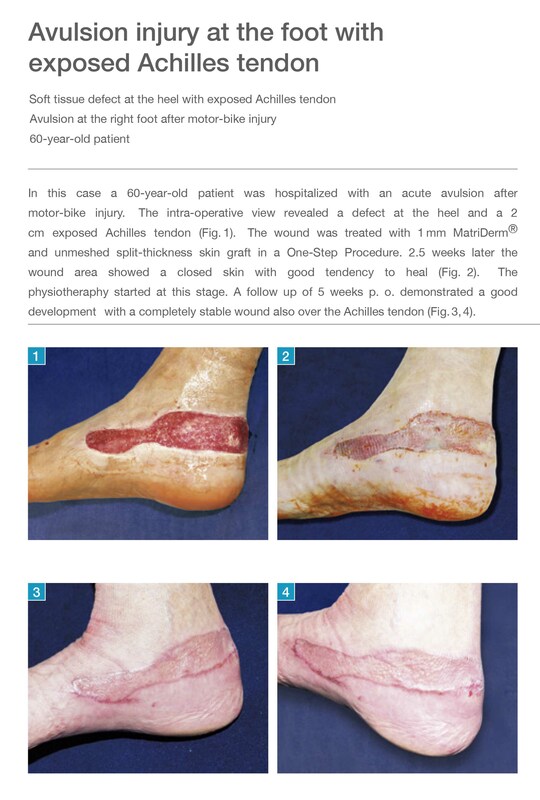 The use of Matriderm in the management of an exposed Achilles tendon secondary to a burns injury. Boyce A, Atherton DD, Tang R, Jawad M.
Soft-tissue defects over exposed Achilles tendons represent a difficult reconstructive challenge. The large array of techniques previously reported high-lights the lack of a single acceptable treatment modality. We have successfully used the dermal substitute Matriderm® in such a case.